The recent paper by Long and Stoy published September 10th, 2014 in Geophysical Research Letters and sent out as a press release⁴ by the American Geophysical Union makes claims that are not fully supported by the data. 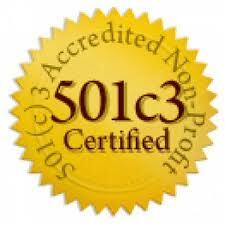 The source of the data is from the NOAA Storm prediction Center (SPC) database of tornado reports. The OAS has no issue with the data, and believes it is correct and representative of actual tornado reports. However, interpretation of the data by Long and Stoy may lead to a conclusion rooted in reporting bias. The accuracy of tornado warnings has increased over the decades, and with the advent of Doppler weather radar, warnings can now generally be issued before a tornado actually touches down. Super Resolution data should lead to increased tornado warning lead times. Simulations using Super Resolution data show that mesocyclone and tornado signatures can be detected at greater ranges than with legacy resolution data. In addition, other smaller scale features should be detectable in base products sooner or with greater reliability. These improvements in technology, combined with greater awareness, greater saturation of news gathering, increased interest in both private and commercial storm spotting, plus an increased ability to rapidly report tornadoes has increased the count of weaker F0 and F1 Fujita Scale tornadoes in the last two decades. The increase in reported tornado frequency during the early 1990s corresponds to the operational implementation of Doppler weather radars. Other non-meteorological factors that must be considered when looking at the increase in reported tornado frequency over the past 33 years are the advent of cellular telephones; the development of spotter networks by NWS offices, local emergency management officials, and local media; and population shifts. Changnon (1982) and Schaefer and Brooks (2000) both discuss these influences on tornado reporting. 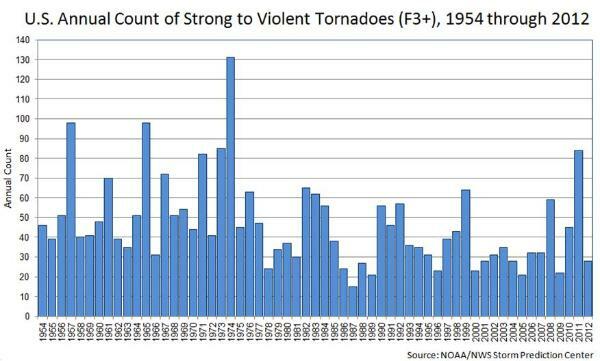 The growing “hobby” of tornado chasing has also contributed to the increasing number of reported tornadoes. The capability to easily photograph tornadoes with digital photography, camcorders, and even cell phone cameras not only provides documentation of many weak tornadoes, but also, on occasion, shows the presence of multiple tornadoes immediately adjacent to each other. These improved detection and reporting reporting methods most certainly contribute to recent increases in tornado counts, and by extension earlier and more frequent tornado counts than would have been recorded 30 years ago. The annual tornado trends chart is a result of the following methodology applied to the SPC observed tornado dataset by Harold Brooks, NSSL and Greg Carbin, SPC5. “An inflation adjustment was developed to reflect the improved detection. 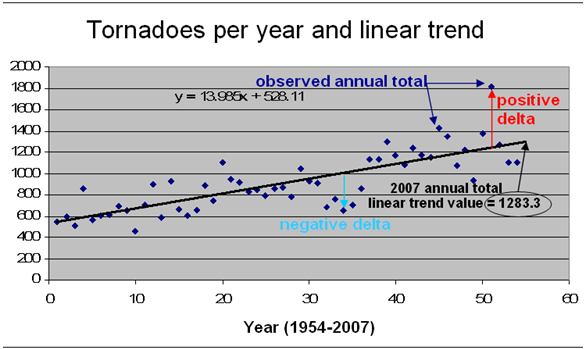 The SPC simple linear regression equation is fit to the 1954-2007 annual tornado totals. This equation is then used to compute the delta, or difference, between the original/observed annual tornado total and the smoothed, or “adjusted” annual total represented by the point on the linear trend line for that year. The answer becomes the adjusted average across the 54-year period, or 1283.3 tornadoes per year. 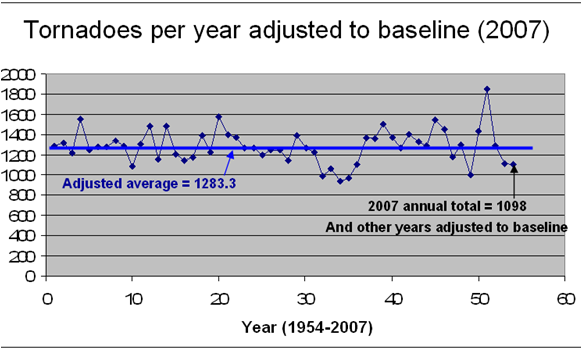 This value is also the max trend line value at 2007 that was combined with the individual delta value for each year to adjust all annual totals in the data set. 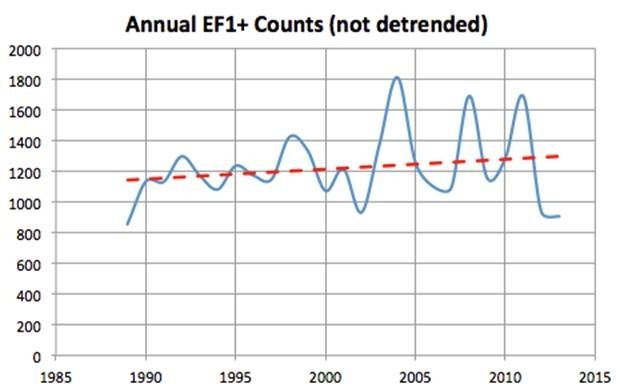 The NOAA SPC had shown in 2013 that there was no trend in strong tornados – EF3+ (see figure 4). “If we take Nebraska out [of the data], it is nearly a two-week shift earlier,” noted John Long, a research scientist in the Department of Land Resources and Environmental Sciences at Montana State University in Bozeman, Montana, and lead author of the new paper. For tornadoes rated above F0, the lowest rung on the original Fujita scale of tornado strength, the shift is also close to 14 days, according to a preliminary analysis by Long and his colleagues that’s not included in the new paper. It is the opinion of The OAS that this sort of methodology to remove a portion of a dataset to cite a result is unsupportable and without justification. Climatic scale detection of earlier onset of tornado activity cannot be dependent upon removal of a portion of the dataset. Other analyses of the same data set by the primary investigator for tornado climatology show that there are no trends in frequency or intensity of tornadoes, and by extension, suggest that the claims made by Long and Stoy are little more than artifacts of statistical methodology and an increase in the ability to spot, report, and categorize tornadoes that would have gone unnoticed and unreported thirty years ago.